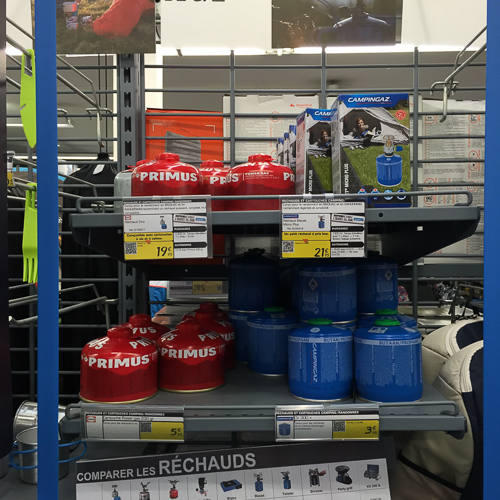 If you’ve ever camped in France and Spain then you know that Camping Gaz is ubiquitous in most supermarkets, gas stations and general stores. 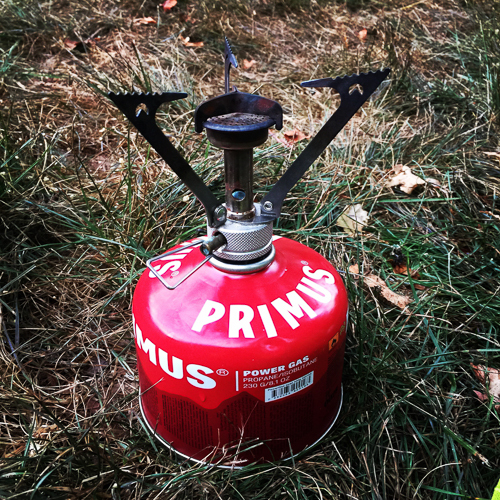 However, if you’re coming from the US or Great Britain, then it’s very possible that you have a camping stove that takes a screw-on gas canister (often sold under the Primus brand), as I do with my MSR Pocket Rocket. On my recent bicycle trip, I couldn’t find this type of gas anywhere. I searched online and it’s a topic of frequent discussion with some claiming they are easy to find and others saying they are impossible and you should buy a compatible stove or an adapter. I solved the mystery myself when I was last in France.  You CAN buy threaded / screw-on camp stove canisters. Where? Short answer: Decathlon. Mystery solved! 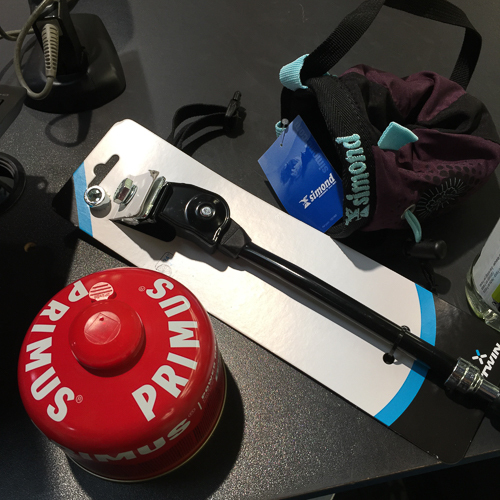 With thanks to Kate for taking me to Decathlon, where I found other treasures including a kickstand and a fashionable waist pouch for my wallet and phone (which is actually a chalk bag for climbers). Thank you so much for your provided information about where to buy gas in France! it helped us to plan our trip! Thanks for your feedback. So glad the info was helpful for you! I’m going to Barcelona and could not find online any stores selling the screw-in cartridges. Thank you, Monica, for saving me tons of googling with this article! Brilliant – so glad it could help! Have a great time in Barcelona! I’m so very happy to hear that! Enjoy!